Would you agree that learning is a lot easier when you’re learning by doing rather than from a book? I’m going to tell you EXACTLY how YOU can do STEM/STEAM at home for your child or student. By the end of this article, you will be an expert! 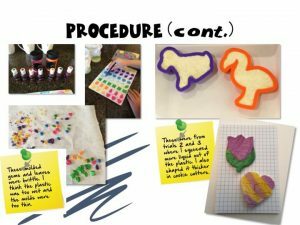 In this article about S.T.E.M./S.T.E.A.M, you’ll learn what it is, where it came from, why it has become the hottest movement in schools today and how you can provide S.T.E.A.M learning opportunities and materials for your child or students that support exploration and discovery in everyday life. 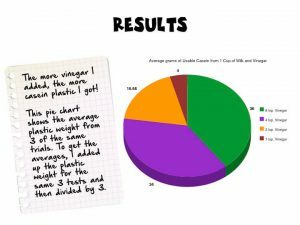 I even share amazing STEAM science fair projects! So, what is it exactly and why is it important? 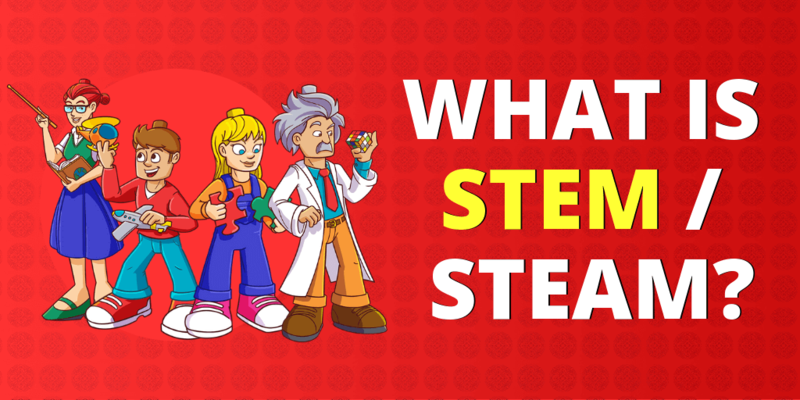 STEAM is an acronym for Science Technology Engineering Art and Mathematics. It is a growing educational movement that entails an interdisciplinary approach to learning through real-world discovery. 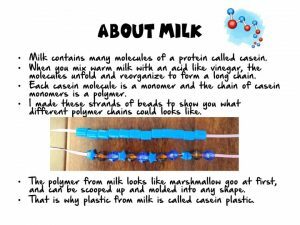 In other words, instead of teaching kids content from subjects independently, there is a crossover that weaves content from different subject matters together seamlessly through exploration. 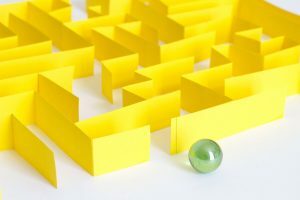 Simply put, integrating various curriculums enables teachers to better connect with, motivate and engage students in ways that reflect real life in a competitive world. 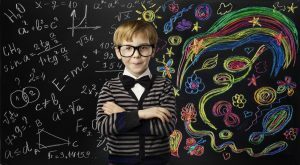 Research shows that there is a positive relationship between early STEAM experiences and success in school. Jobs are also interdisciplinary. Kids not only need to learn to be knowledgeable and competent, but also they need to learn how to think, identify problems, critically analyze them and solve them. 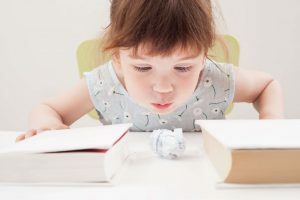 The days of primarily memorizing facts and demonstrating knowledge by testing memory today are eclipsed by more progressive, integrated curriculums that teach kids how to discover and think critically. Why merely memorize when the phone you carry gives you access within seconds to everything imaginable? Why focus on learning how to test well when high test scores won’t help you much in your future career or advance us as a nation? The U.S. has historically been the leader in technology and innovation in the world. The fact is we are in jeopardy of losing our stronghold. I recently read a fascinating, eye-opening article by David Dodwell in the South China Morning Post, Be Afraid: China is on the path to global technology dominance. The article warns us to be wary of the massive global implications of China’s technological advancements, transformation and goal of technological world dominance by 2020. “…look at the 500-metre-wide radio telescope in Guizhou province that has joined the global search for extraterritorial life. Or the Sunway TaihuLight supercomputer which is by far the fastest in the world. Or lithium battery development. 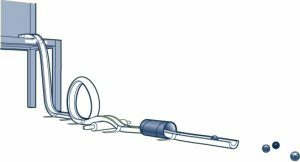 Or 3D-printed blood vessels made from stem cells…the list goes on…” Technology and innovation are critical to America’s future and economic prosperity. It is an important part of our own infrastructure, economy and position in the world. The importance of STEM/STEAM in schools is to maintain our global competitiveness though STEM/STEAM education. STEAM learning begins early with the hands-on things that children do everyday and often though play. 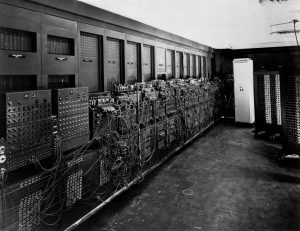 The first ENIAC Computer (Electronic Numeric Integrator And Computer)was completed and put to work at the end of 1945 and spanned across an entire room at 150 feet wide with 20 banks of flashing lights! Late 1950’s-electronic computers were promising, not as household gadgets or educational tools, but rather as computing devices that would help shorten the time it would take for new mathematical theories to develop into practical applications. 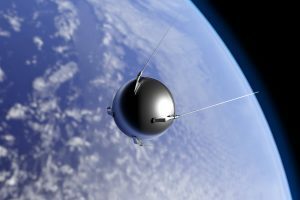 Most STEM/STEAM advocates trace the initiative’s beginning back to October 4, 1957 when the Soviet Union successfully launched Sputnik, the world’s first artificial satellite. It was the size of a beach ball and took 90 minutes to circle the earth. That launch took the world by surprise and put the U.S. on a path to technology and innovation. It frightened the public who feared that if the Soviets could launch a satellite, it wouldn’t be long before they could launch ballistic missiles that could carry nuclear weapons from Europe to the U.S. On November 3, the Soviets did it again, but this time with a much heavier payload, including a dog named Laika. This directly led to the creation of a new government and space program under President Eisenhower called National Aeronautics and Space Administration (NASA). Under the leadership of both Presidents Dwight D. Eisenhower and his successor John F. Kenedy, Americans were challenged to become the leaders in Science, Technology Engineering and Math. In 1958 under President Eisenhower Nasa was born, a new government agency and space program. September 2, 1958 The National Defense Education Act provided $1 billion for science education and research. 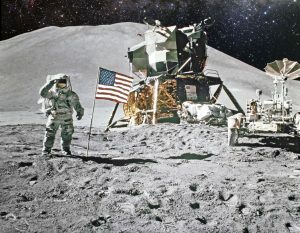 In 1961 President Kenedy continued to push for innovation in the areas of STEM-putting the first American on the moon. 1970’s and 80’s continued to see a big push to encourage science education, and many national science programs were established. 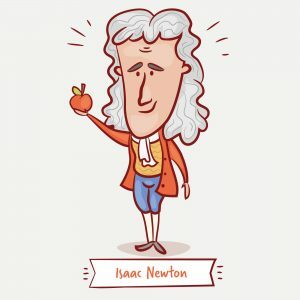 There were big achievements in science and technology-the first cell phone, the first permanent artificial heart, the first Space Shuttle Launch and the first personal computer. March 26, 1970 National Science Foundation (NSF) publishes the Task Ahead for the National Science Foundation. The report identified the future tasks of NSF to include learning, which could increase science understanding for those who were not scientists, and training professionals for STEM professionals. 1981 IBM introduced a new Personal Computer and in 1984 Apple released their Macintosh computer. The personal computer created a new industry of software and hardware suppliers. • On November 27, 1987 The NSF grants an award for collaboration between Merit, IBM and MCI, along with assistance from the State of Michigan to create the NSFNET Backbone which is the precursor to the Internet. 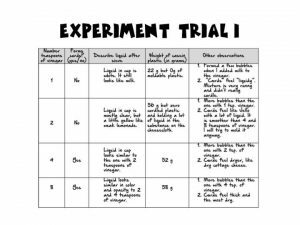 • This is important in scientific education, particularly because students are more open to constructing knowledge based on experiments, surveys, etc. 2000-then-Texas governor George W. Bush planned to allocate $345 million to increase federal student-loan forgiveness for students who major in science, math technology, or engineering and commit to teach in a high-need school for at least five years. NSF in response to the White House Initiative on Tribal Colleges and Universities, NSF provides grants to improve math and science education. 2001, STEM enters the educational lexicon when Dr. Judith A. Ramaley Assistant Director for Education and Human Resources at the National Science Foundation (NSF) along with her team created curricula to improve education in Science Math Engineering and Technology. The group had first come up with SMET as the acronym, but “SMET” was thought to be pretty hard to rally around, so Ramaley changed it to STEM. Educators were starting to combine the subjects before 2001. June 26, 2002 Learning through collaboration and teamwork as interdisciplinary programs between math and science become prominent. This also predates the concept of bridge and pathway programs. 2005-The first explicit mention of STEM-using the acronym-Rep. Vernon Ehlers, a Republican from Michigan, and Rep. Mark Udall, a Democrat from Colorado, had set up the Science Technology Engineering and Math, or STEM, caucus in Congress. That caucus is still around today. A few more mentions of STEM appear in 2006 and by 2008, STEM starts showing up in headlines-an indication it had become a common educational term. STEM was born in science, driven by a national need for economic growth and a desire to dominate the globe in tech with the brightest scientists, engineers and mathematicians skilled across all of the disciplines. So, why add the “A”? The “A’ is for Art but its intent is to incorporate CREATIVITY into STEM. Creativity does NOT reside solely in the right brain as once believed yet articles and images across the internet continue to misinform people. Yes, there was a time when a brain surgeon and a psychologist believed and published information that assigned mental capabilities to each of the brain’s hemispheres. 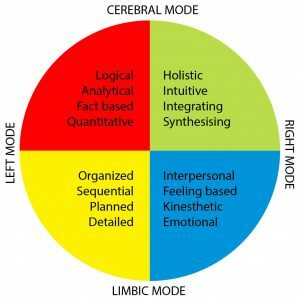 The left hemisphere was shown to be logical, analytical, quantitative, rational and verbal, whereas the right hemisphere was believed to be conceptual, holistic, intuitive, imaginative and non-verbal. The important thing to point out here is that it was believed that creativity resided in the right hemisphere. This dichotomy “stuck” and was believed by brain researchers and authors who have documented this as truth for as many as 20 years. This antiquated thinking continues to spread across the internet. Ned Herrmann, an educator and consultant, who has spent two decades developing models of brain activity and its relationship to the creative process debunks the left brain/right brain concept of brain specialization and the belief that creativity resides in the right hemisphere of the brain alone. He concluded that creativity is a mental process that utilizes all of the brain’s specialized capacities and resides in all 4 quadrants of the brain. In other words, creativity is “Whole Brained”. CREATIVITY is not isolated to one hemisphere of the brain or to one subject taught in school or to any problem solving process. It’s an integral part of discovery and problem solving. 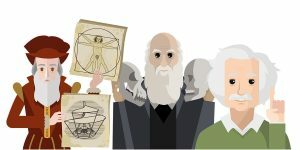 Historically, art played a big role in the work of scientists like Charles Darwin and Leonardo Da Vinci. Einstein was an accomplished violinist. Who knows what role music may have played in his scientific creativity. Even if it didn’t, creativity certainly played a role in his scientific exploration towards solving mysteries of the universe. There are Einstein quotes all over the internet that reflects his opinion that right brain thinking is paramount to intelligence and discovery. Look at modern day American Icons like Mark Zuckerberg, co founder of Facebook. He started using computers and writing software in middle school. Zuckerberg himself recalls this period: “I had a bunch of friends who were artists. They’d come over, draw stuff, and I’d build a game out of it.” He achieved a reputation as a programming prodigy before college where he studied psychology and computer science. Steve Jobs was another American visionary, inventor, designer and entrepreneur. He was Chairman, CEO and Co-founder of Apple Computer, founded in 1976. He was also responsible for the rise of Pixar Animation Studios and NeXt Computer Company. Jobs’ philosophy was that computer scientists must work together with artists and designers – that the best ideas emerge from the intersection of technology and the humanities. STEAM is a movement now widely adopted by institution, corporations, educators and individuals. Rhode Island School of Design (RISD) championed the movement of adding the arts to STEM. It encourages integration of Art & Design in K-20 education. It influences employers to hire artists and designers to drive innovation. Understanding the evolution, influences and history of STEM/STEAM and its purpose helps to shape and direct how we use it in education to further innovation as a way to ensure a prosperous future. STEAM has gained a lot of attention and momentum in recent years as educators look for more effective and meaningful ways to engage students. According to the NSF, nearly 6 million Americans work in science and engineering fields. That’s almost 6 times growth since 1960! The U.S. Bureau of Labor Statistics announced that the number people employed in careers related to STEM is expected increase to more than 9 million between 2012 and 2022. In 2005 the NSF reported 30.9% of college freshmen intended to major in science or engineering, but today that number has gone up to 40%-47% for males. STEM jobs pay well. STEM jobs can more than double the median for workers in science and engineering (regardless of education level or field). Low U.S. PISA rankings placed the U.S. 38th out of 71 countries in math and 24th in science. Low ranking sparked a call to step up our STEM game. Pisa is a triennial international survey which aims to evaluate education systems worldwide by testing the skills and knowledge of 15-year old students..
With a national focus on increasing the number of professionals entering STEAM fields, many educators and schools are increasingly including STEAM curricula into the classroom. A K-8 school in Philadelphia is building an outdoor schoolyard for teaching STEAM. The features will be broken up into “labs”: a habitat lab geared toward learning about plant and animal life; a systems lab focused on hydrology, ecology and storm water management; a motion lab to teach proportion, mathematics, human movement and celestial bodies; and an energy lab to educate about food and waste with areas for soil building and composting from waste streams. The new STEM schoolyard is designed to encourage students’ interest in these areas through hands on learning. It is designed to inspire and engage students with an experiential perspective that textbook reading and instruction can’t do alone. Students in a 1st grade class at an IL school are building UV safe scale model playgrounds. The project teaches principals of design, physics, and engineering. My daughter’s lower school in Las Vegas encourages STEAM learning with enrichment challenges. This year is the DaVinci Challenge. Students are given projects to choose from where they can earn challenge points throughout the school year by doing specific STEAM activities and projects on their own time outside of school. The school awards medals at the end of the year for students who have earned the point goal. LEGO® offers LEGO Education Solutions which are cross-curriculum tools across multiple STEM/STEAM subjects for secondary schools to support STEM learning. The program includes LEGO® bricks, activities, coding tools and supporting lesson plans for teachers. 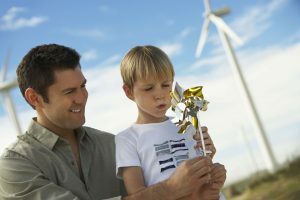 Your child can make predictions about how things move and why. Then test out! An object is in motion when a force acts on it (and it moves). 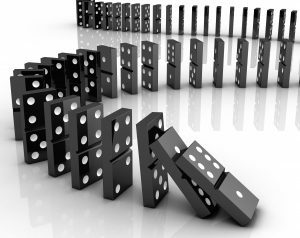 What do you think will happen if you push one domino down? This example is called a chain reaction! This is Newton’s 1st Law of Motion in action! Things at rest stay at rest, things in motion stay in motion unless acted upon by an external force. This teaches that you have to apply unbalanced force to overcome the inertia of an object. What do you think will happen if you roll different weights of toys down the ramp? Try a car, a truck, and different weight balls. What do you think will happen if you add ridges to the surface of the ramp and then roll each toy down the ramp? Does your vehicle slow down? That’s Friction! 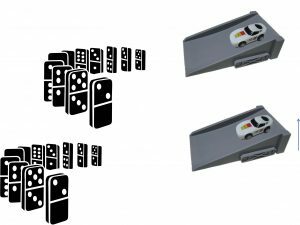 How can you knock the dominos down without touching the dominos or the green car? What happens to each car when you run the black car into the green one? The energy is transferred! • What do you think will happen to the distance the car travels when you change the height of the ramp? You increase the acceleration due to gravity and so the car travels a greater distance. • Make a ball out of paper, or use a ping pong ball. Place it on a table between 2 books. 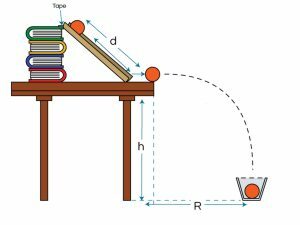 • Can the ball move across the table through the books by itself? 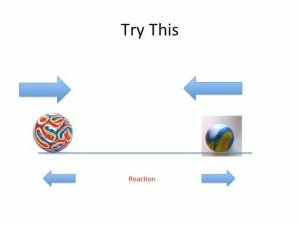 • If you blow on the ball, can you move it? • Try it with a marble. Does it take more force (harder blowing) to move it? It does! That’s because it has greater mass! 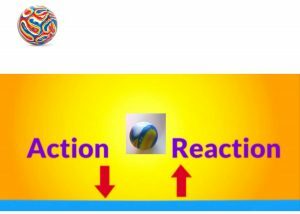 • How can you make a ball travel higher and farther? 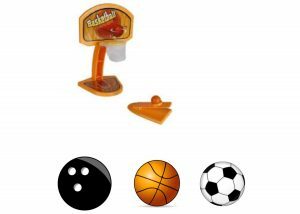 • How can you shoot the different toy balls into the hoop? • Heavier objects require force to move them the same distance as lighter objects. • Drop a super ball on the floor. Watch is bounce back up. • Roll 2 super balls into each other. Watch them roll away from each other after they collide. 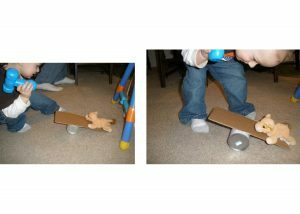 • Create a teeter totter out of a can and a piece of cardboard. 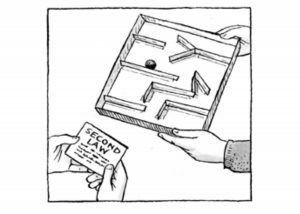 • Place a toy at one end and hit the other with a toy hammer. • Do you think you will have to hit the teeter totter harder or softer if you put a smaller, lighter toy at the other end? 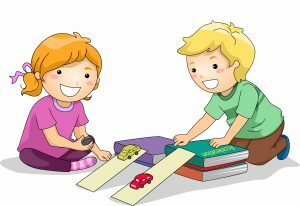 • Hold down a wooden block that is touching the rear end of a toy car. 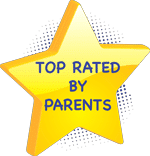 • Have your child roll a second car into the opposite side of the block. 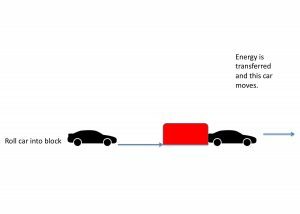 • Watch as energy is transferred to the car on the opposite side of the block! • Energy doesn’t disappear, it only changes form. • In this case, the block stopped the first car and the energy was transferred to the second car. 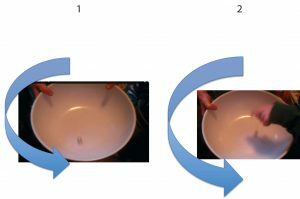 Here is another way to experiment with Force, Motion and the Transference of Energy using a ruler and marbles. • Did you feel the heat? • When you stopped rubbing your hands together, you could still feel the heat. Your motion energy turned into heat, another kind of energy. 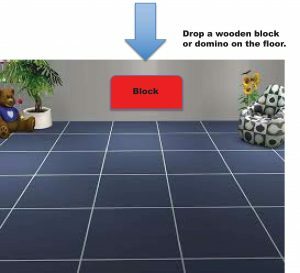 • Drop a wooden block or domino on a hard floor. • It didn’t bounce, but it made a sound. • The energy changed from motion energy to a sound wave, another type of energy. • Do you think the marble will fall down when it reaches the top of the loop? • Does your answer change if we lower the height of the ramp? 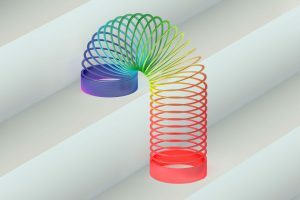 • Why can’t the Slinky go up the stairs? • Why can it go down? • Now, try this on a ramp. • What can you do to make it go down the ramp faster? 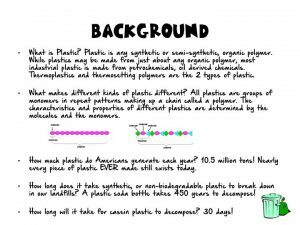 • Make Slinky waves to learn about potential energy, energy transference and Newton’s 1st law of Motion! • Make Longitudinal Waves and Transference Waves. 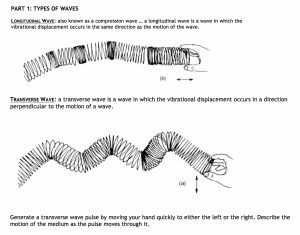 • Can you think of where else in the physical world you can find these 2 main types of waves? Here are a few: light, sound, and water! Bend, then tape card stock strips to the bottom of a cardboard box with masking tape to create a maze. Leave enough space so that your marble can travel through the maze from one end to the other. • Place the maze on the table and the marble in the maze so that it’s still. Why does it stay still? • How can you make the marble move? Can you make it move faster? What is the force responsible for making the marble move? What causes the marble to slow down or stop? • Place one marble in the maze. Now roll another marble into it. Where does the energy of the firs marble get transferred? • Flick the cardboard off of the glass as shown in the picture above. 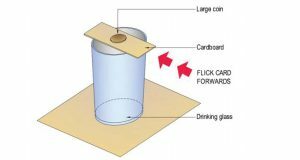 • The cardboard will go flying, but the coins will fall into the glass. • Try it with a stack of coins. What do you think will happen? • Objects are lazy and won’t move until an external force is applied to them. 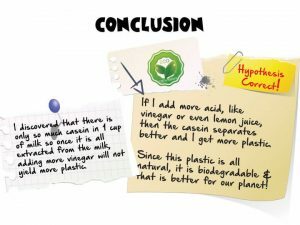 • Spin a marble round and round the walls if a plastic bowl. • When the first marble is spinning fast around the bowl, what do you think will happen if you add a 2nd marble to the same bowl? Do you think it will spin too? Try it, you’ll discover that it won’t. You’ll have 2 marbles in the same bowl and one will be spinning around the sides while other doesn’t. This is a demonstration of centripetal force! • Try to lift the marble in the glass without touching it. • Try moving the glass in a circle many times fast with a marble or super ball inside to watch it climb the glass! • Try to transfer it to another glass. What do you think will happen? Try to get the ball into the bowl! • Try different heights for your stack of books and adjust the distance of the bowl with each try. 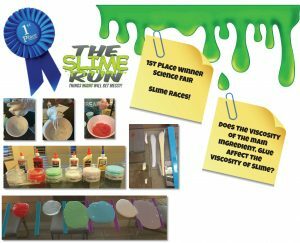 Test the Viscosity of Slime with slime Races! 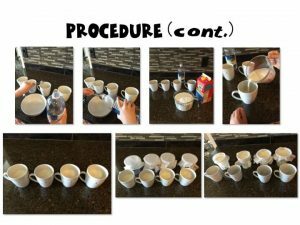 Let’s look at a couple of amazing STEAM-worthy science fair projects that my daughter did. The one I didn’t help her with at all won 1st place in the school wide competition! Way to go Lexi! 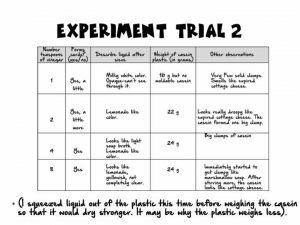 • In this experiment, Lexi 6 made different batches of slime using the same slime recipe (ingredients and measurements) but she changed the glue to different types of glue with each batch. 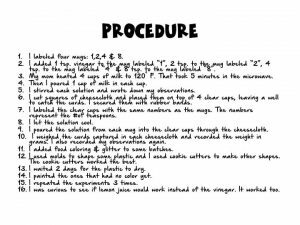 • Her Hypothesis was that the type of glue wouldn’t alter the viscosity of the slime as long as everything else was the same. • She tested it by racing the slime on an angled, glass table. 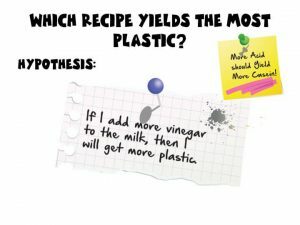 • If her hypothesis was correct, all of the slime the slime would reach the bottom of the rulers at the same time. 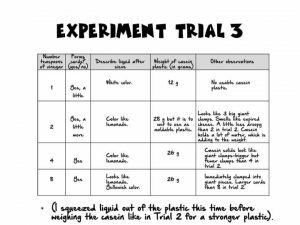 • It turns out, her hypothesis was wrong, but she had so much fun, learned a lot, had slime left over for all of her friends and WON 1st place in the science fair competition for best project! This next Science fair project we did together. It was so much fun but we left the boards to dry on the floor and went out for dinner. 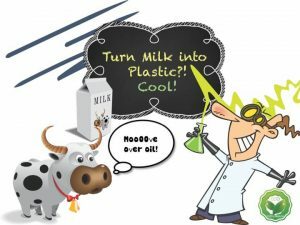 We returned to find that our dog had eaten off of the boards the plastic we made from milk! We were able to erase his paw prints but we had to start all over making the plastic! 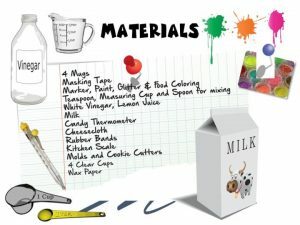 There are so many resources and videos on the internet for STEM/STEAM toys, projects and experiments. It’s such a huge topic and projects differ for different age groups. You’re never too young or too old to learn and have fun with it. 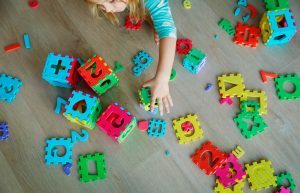 I hope this post sheds some light on what STEM/STEAM is all about and gives you some ideas for how to experience it with your kids or students. I can’t think of a better way to close this post than with a link to my favorite, most enthusiastic, inspirational, Awesome Science Guy’s YouTube Channel-Steve Spangler https://www.youtube.com/user/TheSpanglerEffect Enjoy!